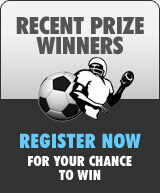 Now into our 18th year TopTipper.com runs tipping competitions for over 50 different sports around the globe. Whether you like Football, Cricket, Rugby, Aussie Rules, Basketball or Motor Sport, we cover it. We also offer 2 varieties to a standard tipping competition, where you can also predict the score of each team and margins of victory - these games are optional. We give away Over 100 Prizes every year, giving you a great chance to win something. This includes a general 10GBP weekly prize winner for someone who has an impressive tipping feat throughout the week. It is free to run your own office tipping competition from our website - and let us do all the work for you! If you want to use our Tipping Competitions as a marketing tool for your company or website then we can seemlessly integrate our competitions into your website. Email editor@toptipper.com for details on how you can get clients coming back to your website on a regular basis. So what exactly is a Tipping Competition? Well, Tipping Competitions are a lot of fun and are played all over the world. For every match in a sporting competition, eg the English Premier League, you have to 'tip' (predict) the winner of each match. Whoever tips the most correct winners gets the most points! You can join in at any time, and get points for "away" teams that have won. And if you forget when you need to submit your tips, don't worry because we will notify you via email when it's time to tip! View the drop-down menu on the right hand side of the page to see all the different tipping competitions we offer. 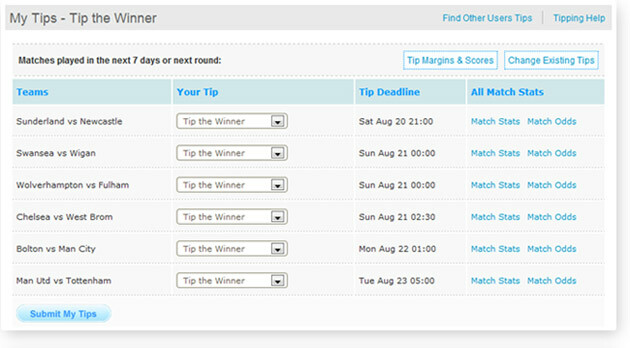 TopTipper's tipping section is a simple interface that allows you to easily enter and view your tips. To help you predict more winners and/or more accurate margins and scores, we provide links to our statistics and odds comparison services for each match. TopTipper also provides both a summary and results page so you can easily see how you've performed against other tipsters. Best of all, we'll send you timely email reminders informing you when to tip, just incase you forget! Copyright TopTipper 2011. All Rights Reserved.